A large very juicy firm fleshed pear. 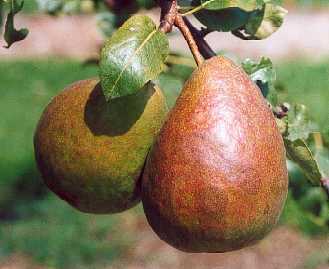 Beurre Bedford pear was raised by Laxton Bros, Bedford, UK in 1902 and introduced 1921. Medium large conical to pyriform fruit. Smooth light green skin ripening to pale yellow. Bright pink flush. Variable amount of russetting. White, coarse, juicy flesh. Sweet, slightly aromatic flavour. Compact, upright tree. Fair cropping. Very poor pollinator of other varieties.